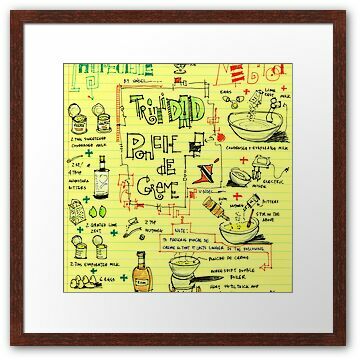 You are more than welcome to print this visual recipe, and place it in your kitchen. Happy New Year!!!! Never forget you have 16 hours everyday to practice changing the world. For 2011… GIVE the best you can and BE the best you can. 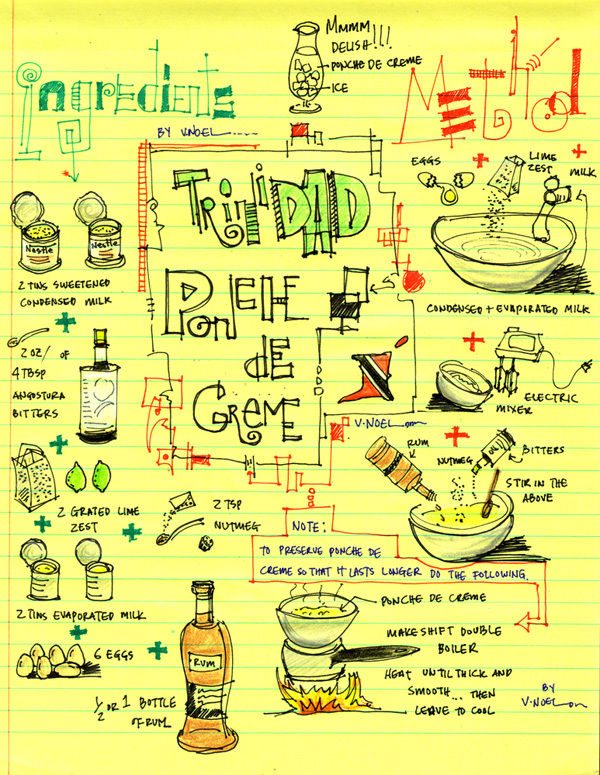 Stay tuned for my Visual Recipe (Trinidad Ponche de Creme)… and check me out on Flickr. 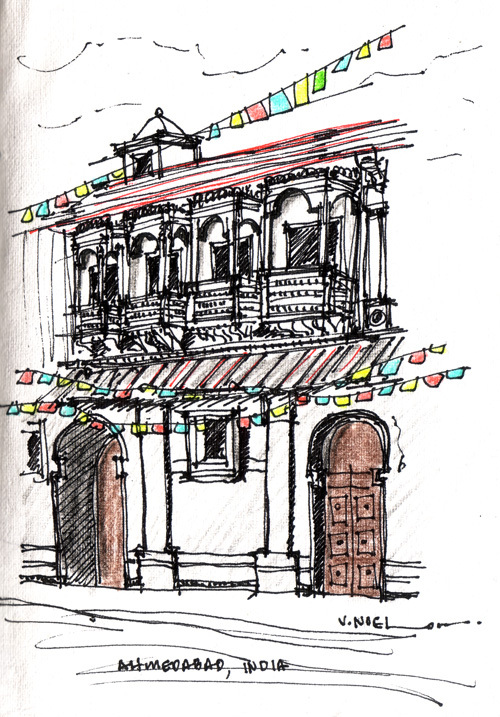 This is a sketch of some of the detail rich architecture in Ahmedabad. Ahmedabad is the capital of the Indian state of Gujarat, like all of India, it is a place of contrasts and dichotomies. Old Ahmedabad has its narrow streets, heavy human traffic, vendors, animals (dogs, and the occasional elephant), and numerous bicycles and rickshaws. It bustles with trade, chaos, and life. 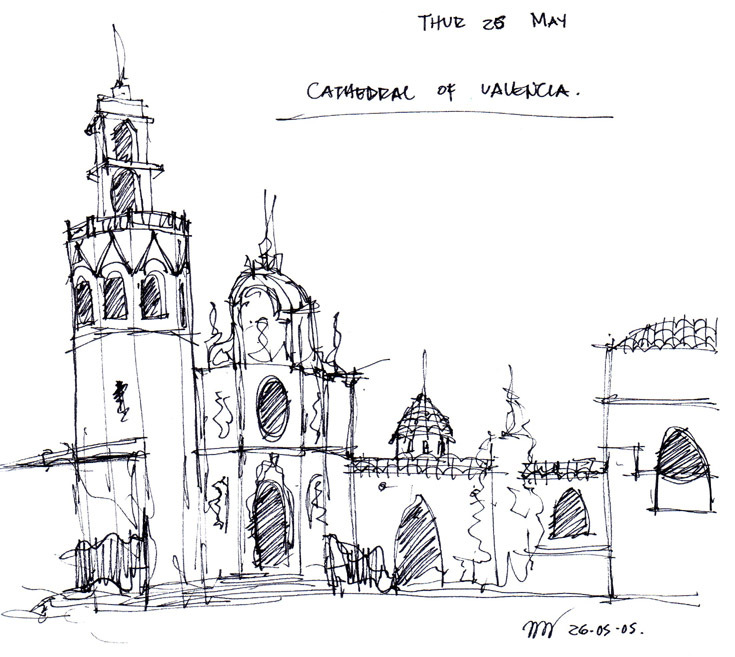 This is a sketch I did of the Cathedral of Valencia, Spain in 2005. The Cathedral is primarily of Gothic style but contains elements of Baroque and Romanesque architecture. Valencia is the birthplace of renowned architect Santiago Calatrava, who designed the futuristic City of Arts and Sciences. 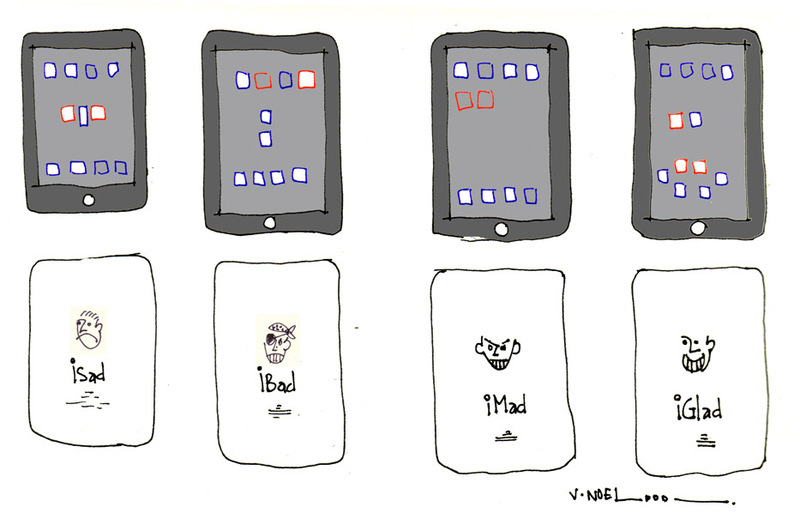 Steve Jobs and Apple are known for their fascinating releases and presentations of products. Here’s an idea for “soft” new releases. I give you the iSad, the iBad, the iMad, and the iGlad. Udaipur, also known as the City of Lakes, is in the state of Rajasthan in India. It was founded by Maharana Udai Singh II… It is a BEAUTIFUL city, and the City Palace is phenomenal. It’s a good city for sketch books too with great leather covers and different types of paper (as you will see in the photo below). 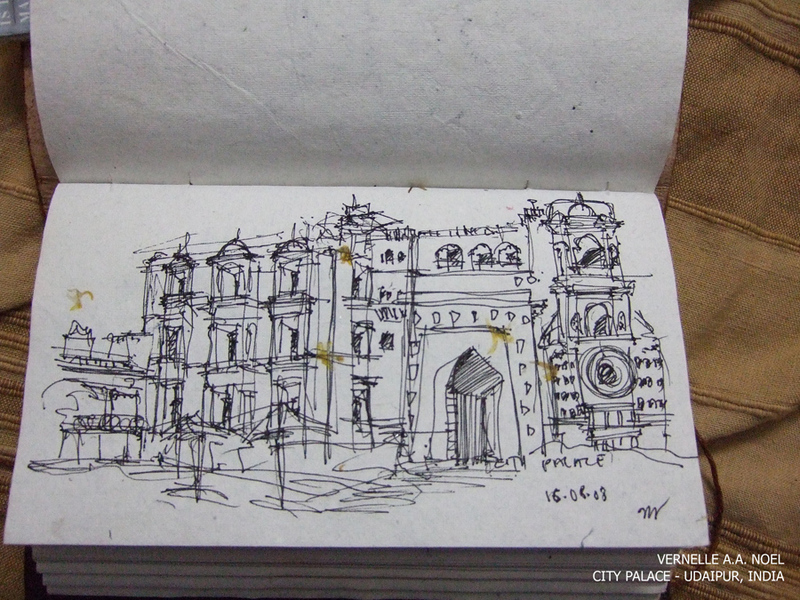 Above is a sketch from inside of the City Palace looking back at the entry gates. 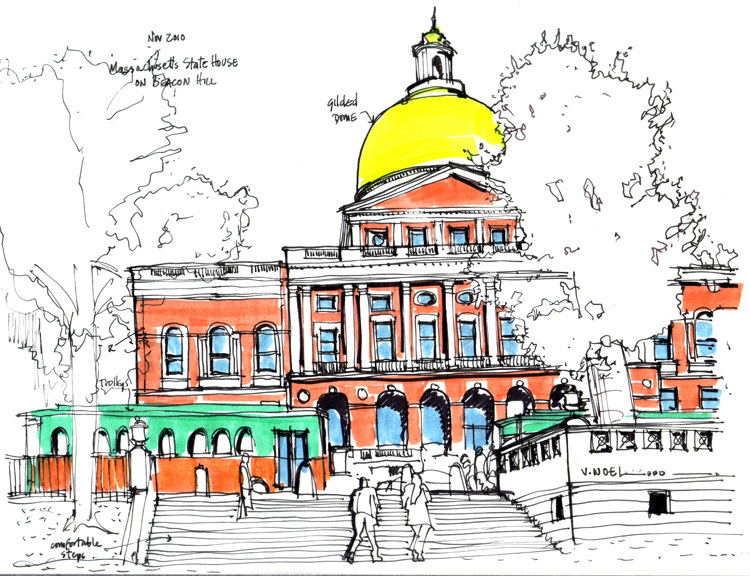 I will post more sketches from India as time goes by. 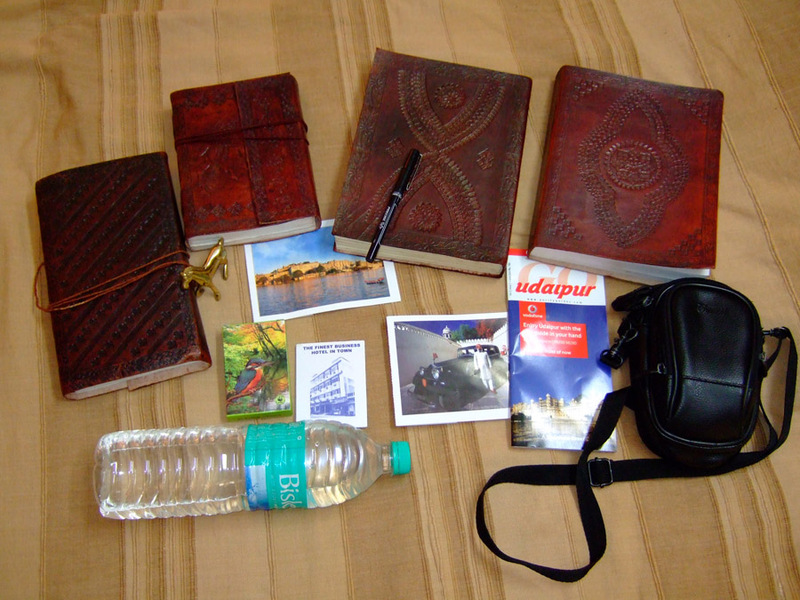 These are my tools I always take on my trips… In India, water was MUY IMPORTANTE (Heat in de place!). Those are the nicely pressed leather sketchbooks I spoke of earlier. 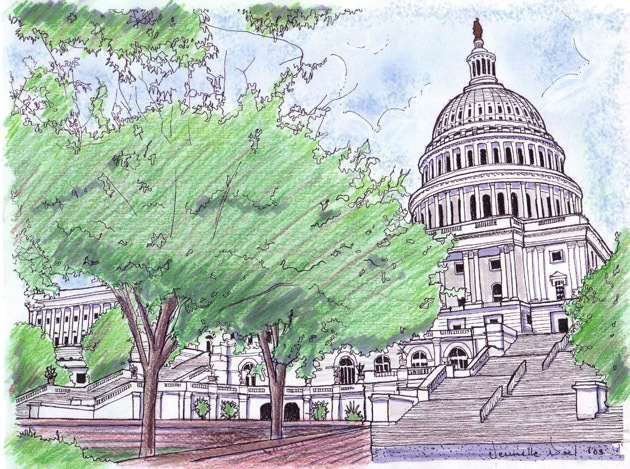 I consider Washington, DC my home. It is where I really “lived” if you know what I mean. I couldn’t believe I was actually there in a city and college of so much rich history and architecture. I think DC to be one of the most beautiful cities in the US. 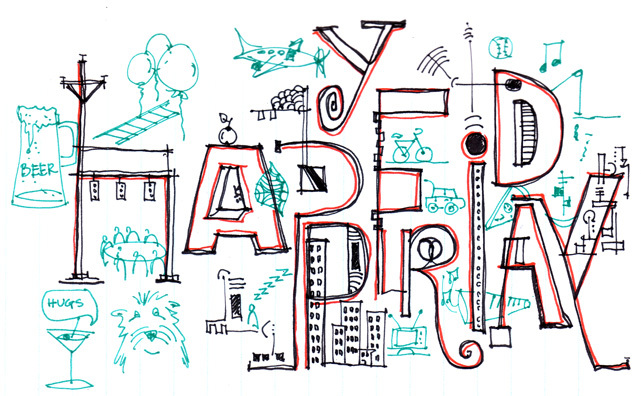 I did this sketch in 2003. I just LOVE DC! One of the Christmas delights in Trinidad & Tobago is pastelle. It is a steamed (or boiled) cornmeal pie filled with meat and other ingredients; wrapped in banana leaves. Some persons who may not have banana leaves use aluminum foil…but the leaves infuses the pastelle with an additional wonderful and homey taste. It is one of my favorite appetizers and I look forward to it every Christmas. 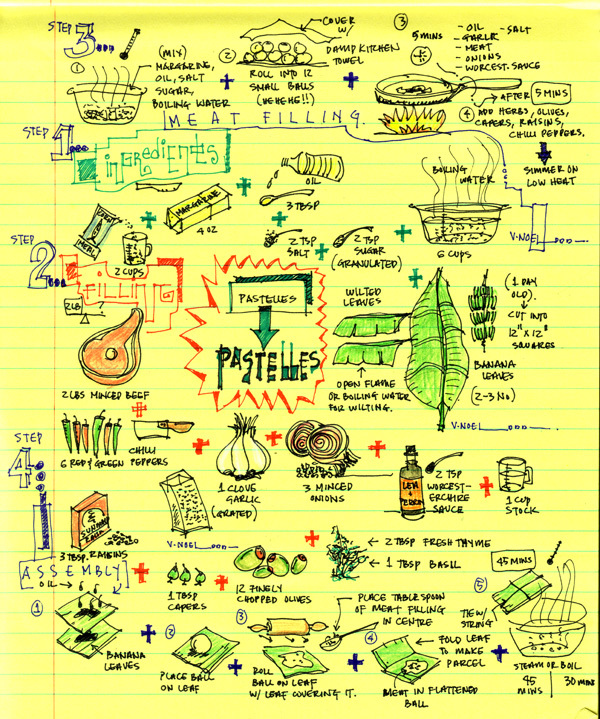 Above is a visual recipe for pastelles I drew. I used the recipe from the Trinidad Newsday (Sunday 5, Dec. 2010). I was told however that 6 cups of boiling water was too much… try 3.5 – 4 cups instead. Hope you try it, and enjoy it! Let me know how it tasted. 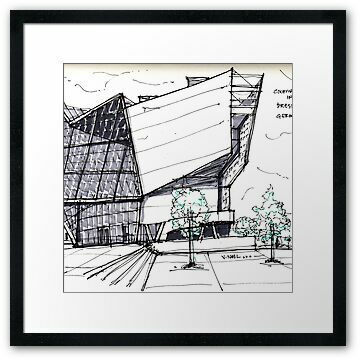 You are more than welcome to print this drawing, and place it in your kitchen too! 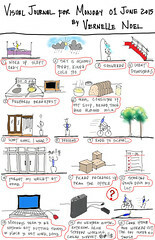 (If you want a larger resolution, just let me know). 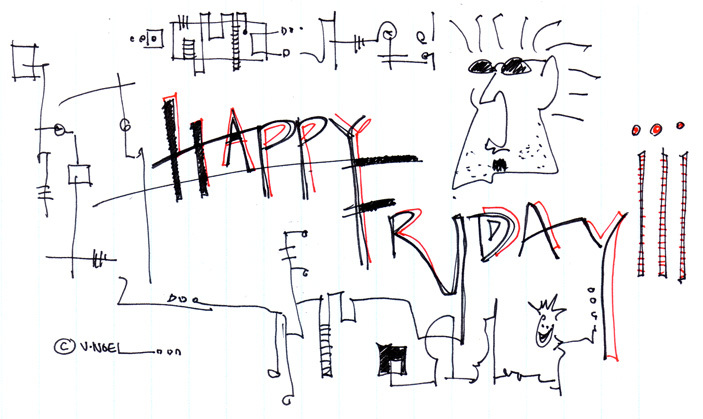 Here’s to a Happy Friday…and weekend! Have fun and Happy holiday season to all of you.